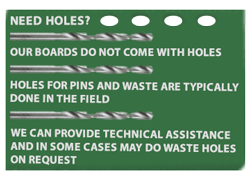 We can't cut your holes for you, but we can sure give you some tips on the best and easiest way to do it! The easiest way to measure where the holes need to be used is by using your old cutting board as a template. You will need a drill, a 1/2" drill bit, a clamp, a pen or marker, and safety goggles (we can't forget about safety here!). 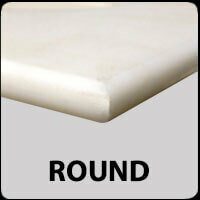 Rounded Edge: Rounded edges leave a smoother surface at the edge of your cutting board. 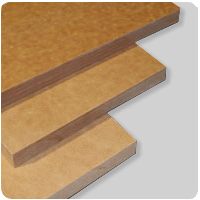 These edges are recommended for boards where the edge is exposed at the end of the prep table. 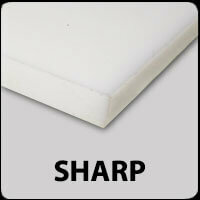 Sharp Edge: Sharp edges leave a 90 degree angle on all sides of your cutting board. These are best for cutting boards that fit in a specific space on your prep table or equipment. With a sharp edge, there is less room for food falling into small cracks and leaving more of a mess to clean up later! The colors of our poly cutting boards aren't just to brighten up the kitchen - they actually mean something! 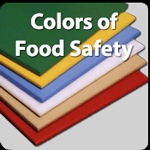 Each color board is color coded to what kind of food you are supposed to cut on it. This way you won't cross contaminate any foods in a busy kitchen. Check Out What Each Color Means Here! 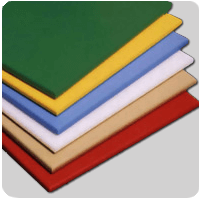 Poly boards can be sanitized using a simple bleach and water solution. Mix 10 cups of water to 2 tablespoons of bleach. Scrub the board with a light dish detergent and allow it to soak for about an hour. Rinse after soaking. Boards may be put away damp if necessary. They are warp resistant so no need to worry about warping! A simple wipe up with a damp sponge on a regular basis will maintain its beauty. Murphy’s Oil soap can also be applied at full strength for regular maintenance. Alkaline soap such as regular dish soap will gradually dull the surface, this usually occurs around the sink area. Howards Naturals Wood Cleaner and Polish will slightly renew the luster if used on a regular basis. Richlite first introduced panels in the aerospace industry - We are cutting on surfaces approved for aerospace! Interested in learning more about cutting boards? Here are some great articles that list some pretty cool tips and tricks, as well as ways to use cutting boards and care for your cutting boards. Regardless if you are a first time chef or a seasoned verteran, cutting boards play an important role in the kitchen.